Liberal Dan Radio 10/23/2013: More government or less government? The simplest breakdown between the two main sides of the political spectrum is if you need more government or if you need less government. So I want to have that discussion today. Where are the places where more government intervention is needed? Where are the places where less government intervention is needed? Many of the people who are against the Affordable Care Act believe that it is a governmental power grab. They believe that it is government run wild and that government shouldn’t have a place at the table. They believe in free market solutions. Do they work? Is full government intervention the answer? I will look at Texas (of all places) to show where a good mix of government and private ownership may be able to bring a better solution. The recent case regarding the arrest of two students after a bullied girl killed herself has also opened the discussion of if we need more or less government. Is bullying a right of passage that government has no right to interfere with? Would cracking down on bullying by making it a crime violate free speech rights? Or does the right to be kept free of harm enable he state to come down and place strict penalties for those who wish to torture and torment other people. A campaign flyer in New Orleans was published before the last election seeking to turn voters away form voting for an openly gay candidate. Should there be stricter laws dealing with such mailers or would that also be a violation of free speech rights? I will also look back at the Erin Cox case and see if we can have any updates with that fiasco. Those issues, tweet of the week, headlines, words of redneck wisdom and more, tonight on Liberal Dan Radio: Talk From The Left, That’s Right. If you are listening to the show during the podcast and want to voice your opinion on the issues heard, go to liberaldan.com. The debt ceiling and government shutdown debates are supposedly coming to an end (at least in the short term). I am not holding my breath until the last vote passes as the President signs the bill into law. But why are we having this insantity? Who is to blame? Is there shared blame? Some Conservatives are even saying that President Obama is to blame for all the divisiveness we are having in this country. Is that another example of insanity? Steve Scalise (R-LA) has an “alternative” healthcare proposal on his website that other Conservatives are also supporting. That policy, in and of itself, is insane. I will go into that explanation as well. There is insanity in other areas as well. Zero tolerance policies are another example of insanity. A high school teenager who did the right thing is one of the most recent victims of these insane policies. Insanity even takes place in the air. A passenger on one airline was forced to purchase two seats. Listen to why this is insane in headlines and I will discuss it more in the show. Have any more examples of insanity, call in (or respond to the Liberaldan.com blog post if you are not listening live and share your ideas). All that, plus tweet of the week and words of redneck wisdom tonight on Liberal Dan Radio, Talk From The Left That’s Right. Back during the healthcare debates of 2009 the GOP promoted a healthcare bill that was their “compromise bill” to the Affordable Care Act. (And when I say compromise I mean the bill that they wanted the Democrats to pass as a compromise to the ACA, some compromise). That bill was garbage. It seems that this bill resurrects all the bad from that bill while throwing out all the good that the ACA has to offer. So, you ask, where can you read this horrible bill? Well right here. So, what makes it so bad? Well, first of all it starts by repealing every single provision of the ACA as well as the “fixer” law that amended the ACA after its passage. What does this mean to you? Well, even Fox News lays out some reasons why Americans will love “Obamacare”. So you lose all that. I have searched the bill that Scalise and other GOP members are supporting for the term “rescission”. It does not exist. So this means that insurers, under the GOP bill, would be allowed to cancel your policy if you are sick. Insurers should be required to insure you through your sickness. If they can just drop your policy if you are sick, it stops being insurance. I searched the bill for the word “maximum”. See, the ACA prohibits annual and lifetime maximums. With this bill, that ban goes away. So an insurer can decide “hey, you have cost us too much money, go pay for the rest of your treatment by yourself”. I searched for “existing” to see how the law deals with preexisting conditions. This bill would push individuals with preexisting conditions into high risk pools. This forces high risk insureds on the state without allowing the state to benefit from the pooling effect that comes with the inclusion of lower risk individuals. This plan would bankrupt the states. Anybody living in Louisiana should know how horrible high risk pools are. Congressman Scalise should be familiar with Citizens insurance. This was the property insurance of last resort for homeowners in Louisiana. It would be made available to those businesses that didn’t want to write business in certain areas of Louisiana. It was expensive and it was broken. Citizens did not get to offset its high risk policies with lower risk ones. It was automatically doomed to fail. Yet he wants to do the same thing with health insurance? That is not how insurance is supposed to work. In insurance you create large pools so that the losses from certain people are offset by the lack of losses from other people. The previous bill allowed insurers to select a home, or primary, state where the insurer will be based. By selecting this home state the GOP sponsored bill would allow a company operating in state A to circumvent the laws of state B if it sells policies in state B. This is a violation of the 10th amendment. A state should absolutely be able to dictate regulations on the insurance products sold within its borders. This idea stems from the lie that Conservatives often repeat that a company should be able to “sell insurance across state lines”. I work for an insurer. I have written code specifically to handle insurance that the company sold in a state other than the state we are based. The only requirement is that the policies sold in other states needed to follow the laws of that other state. This is reasonable. The GOP suggestion is not. This is clearly written to eliminate the idea that oral contraceptives should be considered to be preventive care. It is considered preventive care under the ACA. The GOP hates oral contraception (even though it prevents abortion). Go figure. This is just stupidity. The bill imposes medical malpractice limits. For some reason the GOP thinks that reducing the possible money that one can get from a medical malpractice case will some how help insurance rates. It doesn’t and it also winds up hurting patients harmed by malpractice. Watch one example of how medical malpractice caps hurt people. And of course, to make sure the bill doesn’t pass, the GOP included abortion language. Because nobody knows the body of a woman and its needs better than Congressman Steve Scalise. This bill could very well pass the House. There is no way it passes the Senate. So why propose this garbage? Well, just to waste time I guess because the GOP in the House of Representatives are not doing anything else meaningful at the moment. So why not introduce a terrible bill to boot. The GOP responsibility on the debt ceiling, in a nutshell. Imagine you have a credit card. On that credit card you schedule several auto-payments that will charge the credit card for goods or services over the course of the year. That card has a limit. Now, you know that if you do nothing but pay the minimum payments on the credit card that eventually your auto payments are going to cause you to exceed your credit card limit. If you do nothing and allow this to happen, you will have increased fees, the amount you pay for that debt may go up to a penalty rate, and when the card rejects further payments to those other companies you will either lose those services you enjoy or the items that you purchased. If this happens to you, you would likely be called irresponsible and rightly so. The GOP is in this same boat. They agreed to a certain amount of spending over the course of the year. They knew that at some point during the year that the debt ceiling would be reached if they didn’t do anything. Now, unlike you in the credit card example, government has more options. They can cut spending (i.e. the spending they already agreed to), they can increase revenue, and they can increase the amount of debt available to them. See, unlike you, they have a Constitution that states the debt of the United States may not be questioned. But the GOP refuses increased revenue. During the Republican primary debates, when asked if they would accept a deal that reduced $10 in spending for every $1 in revenue gained via taxes, not one person would agree to this. And the GOP refuses to commit to increasing the debt ceiling. In doing so they push us closer and closer to the edge. They are playing a very dangerous game of chicken that could be avoided IF they would just agree to allow the spending to take place that they agreed to in the first place. And that is the problem in a nutshell. The GOP agreed to put the country on auto payments to the point that we would reach the debt ceiling. SO the GOP must now do the responsible thing and increase the debt ceiling so the problems do not turn into a crisis. Anything else and they can NEVER claim to be the party of “fiscal responsibility” again. I will be continuing the discussion of the lies surrounding the Affordable Care Act. Some have popped up just recently in the last week and some have been around for a while. I will go over some of the newer ones (like people who try and compare premium costs with yearly costs) and some of the older ones (like the lie that Conservatives repeat that they must be right on healthcare if a majority of people polled oppose the law). I will also go into a little bit of the government shutdown. Who is really to blame? Various opinions have been given and I will go over some of them here. 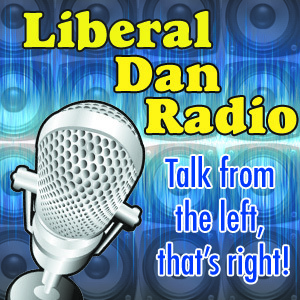 Those topics, Words of Redneck Wisdom, Headlines, Tweet of the Week and more, on Liberal Dan Radio: Talk From The Left, That’s Right. This eposide will be devoted to the Affordable Care Act, i.e. Obamacare. What does it mean for you? What are the benefits? Are there any drawbacks? Is the law perfect? What would I change about the law? But this just scratches the surface of what we can talk about when it comes to Obamacare. There is also the vast criticisms from the right wing about how bad it is. If the law was that bad, why wouldn’t the Republicans allow it to fall flat on its face? And what are the lies out there? Conservatives are spreading all sorts of lies about the law and they need to be debunked. Is Congress and the Presdient really “exempted” from the law? Is that even possible? If not, where does that idea come from? What about the idea that Obama lied about losing your coverage? What did he say? If someone loses coverage between the passage of the law and now, does that mean that Obama lied? And that just scratches the surface. All of those topics plus headlines, the tweet of the week, words of redneck wisdom and more Wednesday on Liberal Dan Radio: Talk From The Left, That’s Right.